The art studio is up and ready! I've spent most of this week sorting, throwing away, packing up, and cleaning over 10 years of "stuff" in my art room so that it would be a functional place in which to create. There were moments of being overwhelmed. I would find things that needed to go to another location - go to that location, only to become distracted by the disorganization in the new location - eventually managing to make my way back to the studio to begin the process again. 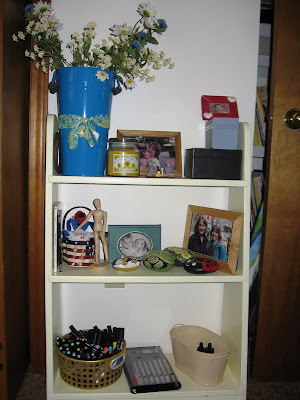 The day of reckoning is coming when I must face the basement: the final resting place of "stuff". With my art studio inviting me to do something other than cleaning, I began my illustrated journal. Just putting something down in this beautiful, handmade book was daunting. On a run yesterday, I pondered the roadblocks in my thinking. Would the things I draw and write about be good enough? For who? I'm not creating this book for public consumption - ahhhh...will it be good enough for me? That voice inside of me that tells me that I'm not good enough. If I actually commit something to paper, maybe it will confirm that voice. I'm trying to talk back to that voice, but it's hard. My running is an example of how hard this can be. I've been trying to tell myself that no one cares if I'm walking or running as they drive past...I need to listen to my body and walk when I'm too tired and run when I feel recovered. No one cares but me, right? Yesterday after I had run for quite a long way before walking, I slowed down to let my heart recover. I was walking happily when a man yelled from his yard, "You're the slowest jogger I've ever seen". So much for the theory that no one notices or cares but me!!! Self-image while running is another roadblock for me. I've told myself that no one cares what I look like as I'm running but me. A pick up truck passed me and barked at me a few days ago. Well, I was running with Sprecka. Maybe they were trying to encourage Sprecka. Honestly, what's a trying to turn over a new leaf self-critical person supposed to do? Part of cleaning out the art studio involved going through years of teaching materials: curriculum I developed, examples of student work and notes, photos from Williamsburg and the Seattle Institute, and awards/recognitions. Closing any chapter of your life is always a bittersweet thing to do, but I talked to myself about the difference I'd made in many students' and teachers' lives, knowing that I did my absolute best and that I had done some incredible work. Last night, after a baseball game, I ran into an officer in the school PTO, who remarked to me after obviously hearing that I was not coming back next year, "So I guess this means that your husband won't do the balloons for our family fun night this fall". So much for the impact I've had on students!! I'm off to take a nature walk. Trees, grasses, flowers, and the wind blowing through my hair, I understand. People are so self-absorbed, they tend to think about what affects them most - hence the balloon comment. You did make a huge difference in many students' and parents' lives, one they may not even be aware of. You should be incredibly proud of all you accomplished as a teacher. And as for the jerks while running, trust me, they're everywhere. I always just remind myself that they are not running, they're sitting in their yard or driving in their behemoth truck, trying to ruin someone's day to make themselves feel better about their own lousy, lazy lives. 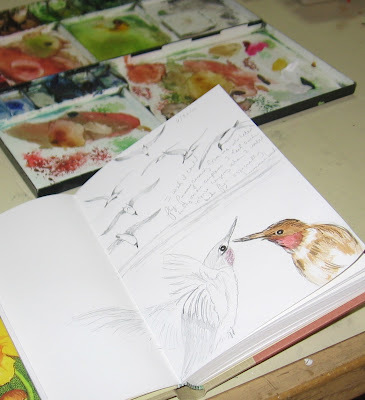 I'm so glad that your art studio is ready for you to start creating in, and I love this peek at your journal - already so beautiful and captivating! Friend of mine, thank you for sharing your day. And getting back to your art. Dear heart, you're on the right track. This is your life- the only things that matter are what YOU think. I once read "What other people think is none of my business." What an eye opener that was for me.So,keep listening to your body and keep following your joy.